I have one item to offer for this week. Since I have finals this week that has been my focus and not much else has been getting done. I have next week off and many items I plan to complete. My first love, crochet has made it back into my life and finding Ms. Afya Ibomu on Uncommon Threads lite the fire under me and got me grabbing my hooks out of the closet. So here’s my offering for the week. 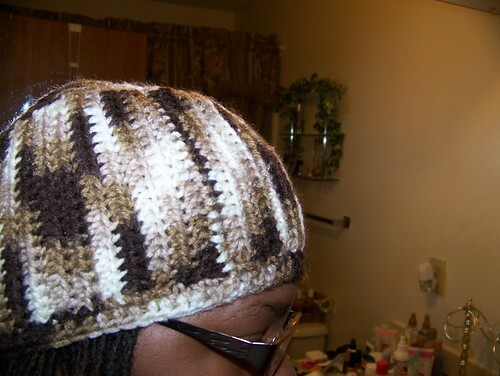 This is my fifth Soldier Cap from Afya Ibomu’s book Get Your Crochet On! This was crochet on size G hook and scaled down from the pattern by 6 rows for the body and on the brim I eliminate the last 2 rows since this is for a child. Until my next post Be blessed, be positive, be truthful, be joyful, be at peace, and be CREATIVE. Here are my WIP’s for the week. First we have my newly reformed Ruffles Shrug in Serendipity Tweed from my Flair project. 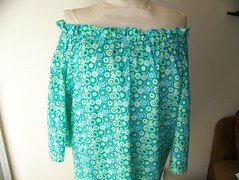 I’m currently on the ribbed collar as this a top down raglan styled shrug. 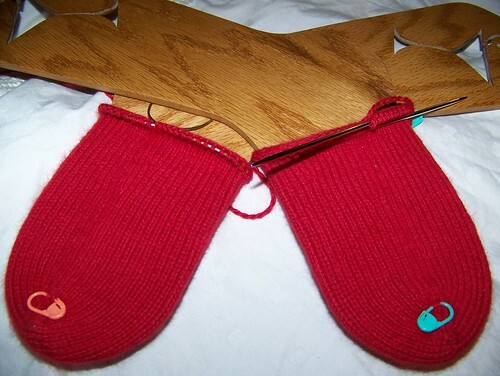 Next is my youngest daughter’s Basic Toe-up socks using Cascade Cloud 9 in Red. As you can see I’m making good progress on these using the ML (magic loop) method and my trusty Addi Turbo circs. I cast these on 3/19 and hope to be done no later than Weds. 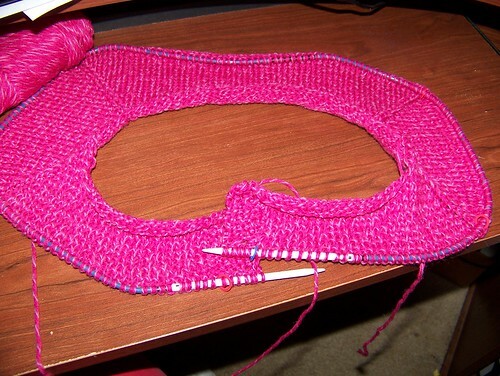 If only I was a faster knitter. Here’s a new take on Oatmeal Cookies. 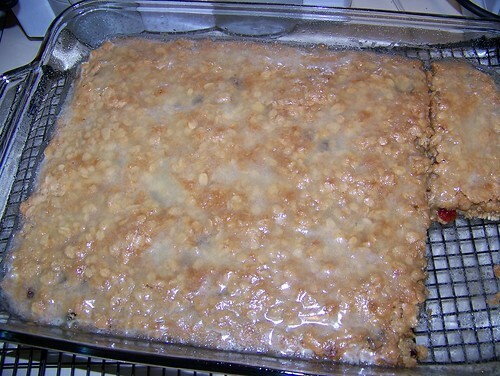 I call it my Oatmeal Cranberry Orange Bar w/Orange glaze. I added orange flavored cranberries to the mix with some orange zest and it turned out pretty good. Added the orange glaze and OMG sinfully rich now add a scoop of Vanilla Ice cream and OOOOPS there it is a nice twist to the average cookie recipe. The girls and I loved it. Now on to the confession. 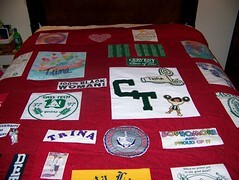 I have been working on a quilt for the past year and I will through pictures let you take the journey and then I’ll give the present status of this project. Photo 1. Black backgroud to make the T-shirts pop. 2. Switch to Red and pink backgroud per request of recipient. 3. 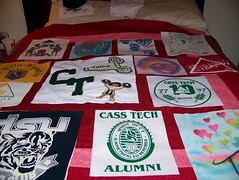 Trying to place the t-shirts so that the quilt is appealing 4. Ripped all that out and started from scratch and it’s working better. Current status. 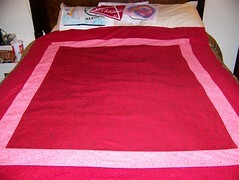 I tried to machine quilt this and even with my walking foot it was not going well. So now I’m hand quilting this project and it’s long and tedious work but I see the light at the end of the tunnel and I know the recipient can’t wait to get it. Now I do have to say in making quilts and have things not work while someone is expecting it puts the creative process in a totally different place. I finally shared these truths of the Year Long Quilt as a way of making myself take the time to complete it and ship it off. There have been some times of frustration and then some times of joy while working on this but the biggest thing I have come away with as I near the end of this quilt is that you can’t take things to seriously and to expect the unexpected. I hope that you will take time to revisit and come to terms with some of the frustrations of creating a piece of work. Rather it be knitting, sewing, quilting or whatever your crafting media is it’s a learning process and at the end you have grown in knowledge, gained a new perspective and will know what you can or can’t venture into. It’s all a part of finding your niche. Until Friday, I hope you all have a great week and as always Be blessed, be positive, be truthful, be joyful, be at peace and be CREATIVE. I’m back for my second installment of FOF and to share some new findings or better new direction. The one thing I was looking forward to sharing in this post was 3 tops that are various stages of completion but that maybe in next weeks gallery. I do however, have 2 crocheted and 1 knitted objects to share. 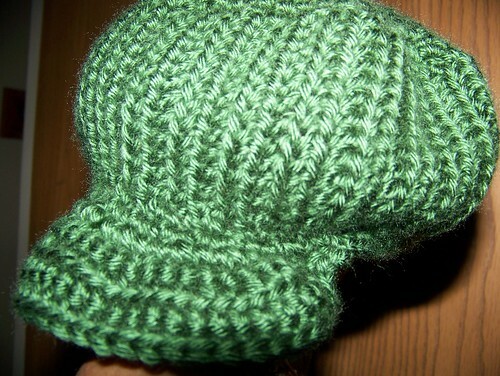 First on the list is a Cap that was being made for my youngest DD from Afya Ibomu’s Get Your Crochet On! I’m fixated with Soldier and so is everyone around me so that’s what I’ve been making. 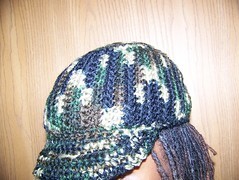 I had been making this cap for her and it was too big so I omitted the brim to have a different look. 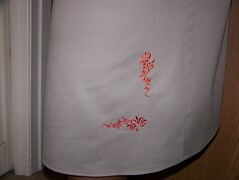 I like it and think you could embellish it with a flower in brown or white for some contrast. 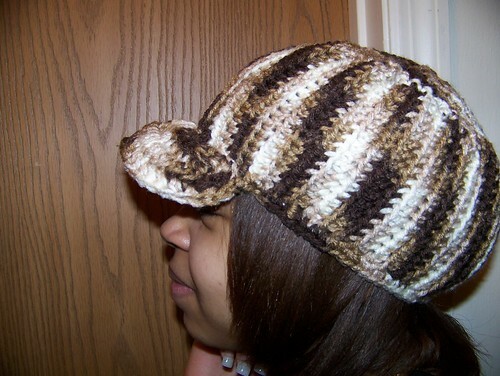 Both of these caps where crocheted using Red Hearts Multi in brown, tan and white on size H hook for the body and top of hat and size G hook for the brim. One skien in 141g 244 yds can make 2 caps. My next offering to my FO pile is my 5th pair of socks using the ML method of knitting socks. 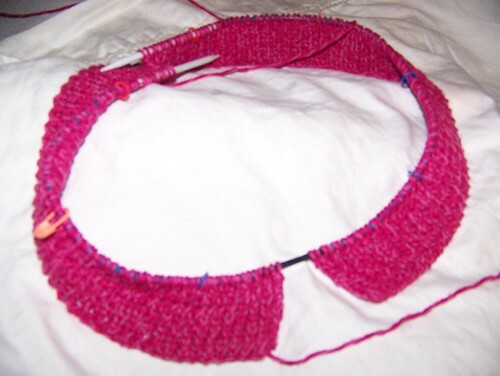 I used Cascade Cloud 9 yarn in Pink on size 2 Addi Turbo circs. 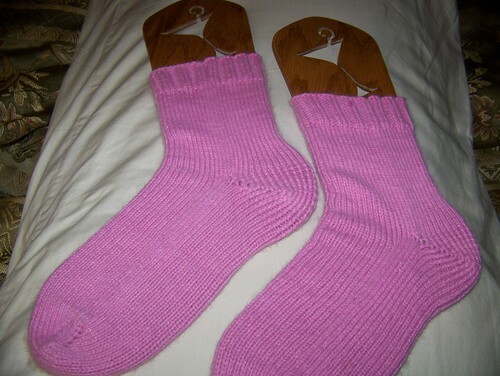 The pattern is Cat Bordhi’s basic sock pattern. I love this method and look forward to meeting my goal of 12 pairs of socks by years end. There are just a few things I need to tell you about new beginnings. In each day we have a rare opportunity to start anew and I’ve always been a crafter with that view. It’s not always the method but the course that makes the difference in the end. Have you learned something new? Did you take the time to really look and appreciate the art in your creation or does it have to look exactly like the pattern pic? I love the little quirks that are uniquely mine and keeps me grounded that God is perfect and I have yet to achieve perfection but I’m perfect in the scheme of who he made me to be with all the gifts and wonders that are now in my life. I brought this up to ask you to look at your approach to your crafts and although we want to be and do our best we are human and mistakes are allowed. Don’t beat yourself down because something doesn’t work for you just take another look at it, reevaluate your approach and keep at it or start anew. I shared this with you because I had this experience this week. I started Flair for the Ravelry group EbonyElite Sister Friends and as time went on I got frustrated with it for the lack of understanding in my mind’s eye. I let it sit for a week and begin to look for answers to the things that puzzled me. 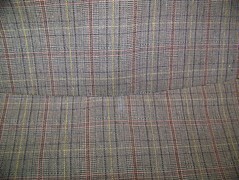 I found the answer and the light bulb went off but I just wasn’t excited about the pattern choice. The next day I was going through my paper pile and came across some old magazines and found a pattern more to what I had wanted to knit during our KAL and gingerly set about froggin’ Flair and casting on KnitSimple’s Ruffled Shrug from Holiday ’07. I’m a lot happier with the progress and because it fit what I had envisioned for a nice spring and summer cover up to go with some summer dresses. I have this Shrug on the needles along with a pair of Socks in the Cascade Cloud 9 in red for my youngest DD. Will show progress pics on Wednesday. I found two patterns in this book that caught my attention right away and that’s Fixation and Lace the lime green ones on the cover and Diamonds and Lace (not pictured) both seem pretty straight forward at first glance of the patterns Her book focuses on using 2 cirs at a time which is fairly quick knitting for those of you are coming from the 4 DPN’s. I also purchased Melissa Morgan-Oakes’ 2-at-a-time Socks I’m not so drawn to the patterns as I am drawn to the technique that she gives. With that being said, I do like Belle Epoque and Spice(like the colorwork) First she has all patterns sized and coded in Women’s med., Womens’ Lg/Mens Sm, and Men’s Med. 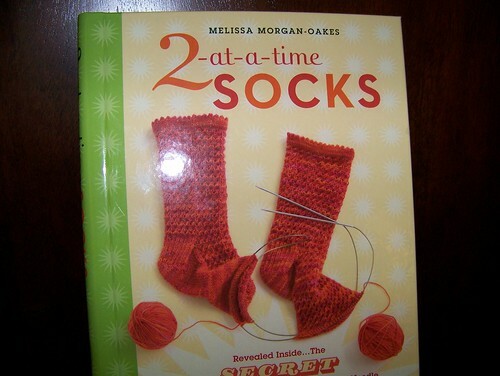 Now although I like both of these books for they offer a wealth of knowledge they leave out two items that would complete the whole spectrum of sock knitting and one would be to include toe-up and secondly short row heels. No this is just my take on what I’m would like to see in a book of this nature that would make me feel that every option to socks was included. 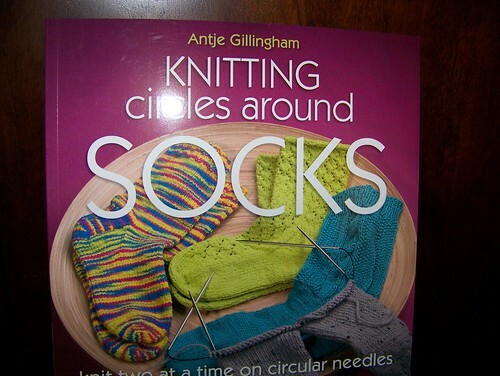 My Next venture is Fetching……..yes, I’m the last knitter who hasn’t just started knitting to make a pair. 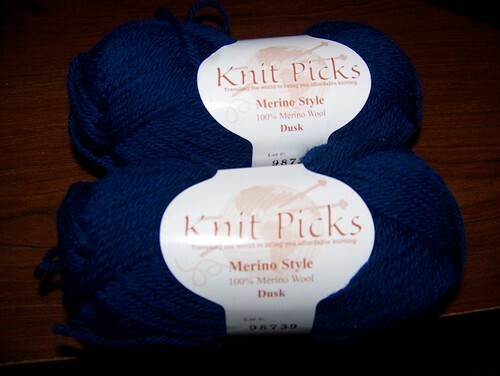 I will be using Knit Picks Merino Style in Dusk these are for a SWAP partner on Ravelry. Well it’s time that I run so that there will be something to show on Friday. 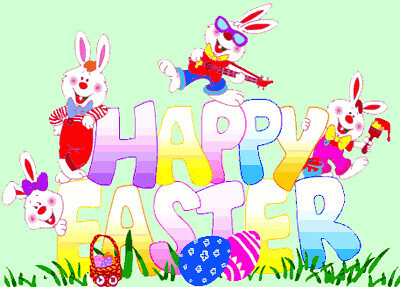 Be blessed, be positive, be truthful, be joyful, be at peace, and be CREATIVE. This weeks post will have to be postponed until next week due to illness. Mine. I have some type of allergic reaction to something and my back, chest, stomach and thighs are broke out. So I haven’t done much if anything productive in the last 4 days. I’ll be back next Friday. 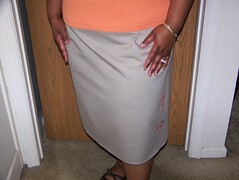 Here’s my second installment of FOF and I’m happy to say that there are 3 items that I’ll be posting today. First up, I’m working on crocheting Soldier Caps from Afya Ibomu I have linked her books in previous post. Here’s my third Soldier Cap I used Red Heart in Camo with size H hook for the body and size G hook for the brim. 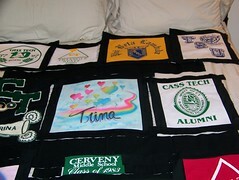 This is a quick project and can be done in one sitting. Please come back for next weeks installment of FOF. Until then Be blessed, be positive, be truthful, be joyful, be at peace and be CREATIVE. 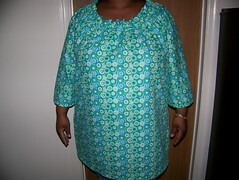 I’m working on McCall pattern M5401 and it’s the first time I’ll be making a top. It seems pretty harmless but I had to change my approach to this. I did take the time to get my measurements according to the pattern specs and put those measurements on the pattern and cut them out. Right now I’m feeling very anxious about putting this together and making a major mistake. This could just be the doubt of fitting for myself since I have yet to have a dress form that really works for me. Like most other things in my life I’ll just have to jump in and either it will be a success or failure and I’ll learn what not to do the next time. 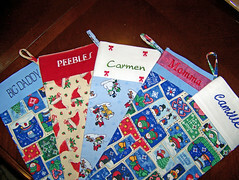 In retrospect that is the journey you go on when teaching yourself how to be a crafter of any sort. 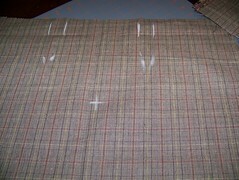 Stay tuned for the conclusion of McCall pattern M5401. Stay tuned for next weeks installment. Until then Be blessed, be positive, be truthful, be joyful, be at peace, and be creative.